A rocker, a roisterer, a dreamer and a rambler, Ronnie Lane was the musician who caroused his way to the top, then ran away to join the circus. He made his name in the 1960s as the bass player with the Small Faces, most of whose songs he co-wrote with the singer and guitarist Steve Marriott. And he did it all again with Rod Stewart and Ron Wood in the Faces, a band who worked, played and thrived according to the motto “one for all and all to the bar”. Then, in 1973, Lane took off for the country and started his own band, a rustic folk-rock ensemble ironically-named Slim Chance. With them he scored the hit singles, ‘How Come’ and ‘The Poacher’ and in 1974 embarked on The Passing Show, an ambitious but heroically disorganised tour of the UK modelled along the lines of a travelling circus, which has passed into rock folklore. Lane released four, glowingly-remembered albums with Slim Chance during the 1970s. But in 1976, he was diagnosed with multiple sclerosis. Lane continued to record and to perform when possible, but after a long and debilitating illness he died in 1997 at the age of 51. Ronald Frederick Lane was born in Plaistow, East London on April Fool’s Day, 1946. He took up guitar as a teenager, then switched to bass after forming a band called the Outcasts with drummer Kenney Jones in 1964. The pair hooked up with singer and guitarist Steve Marriott, and the Small Faces were born. Joined soon afterwards by keyboard player Ian McLagen, they were four East End mods who gradually morphed into Britpop hippies as they enjoyed an amazing run of UK hit singles including ‘Whatcha Gonna Do About It’, ‘All Or Nothing’, ‘My Mind’s Eye’, ‘Itchycoo Park’, ‘Tin Soldier’ and ‘Lazy Sunday’, all co-written by Lane and Marriott. They released three studio albums including the extraordinarily-packaged Ogdens’ Nut Gone Flake (1968), a concept album which topped the UK chart for six weeks in the summer of 1968 and remains a touchstone of the British psychedelic era. Marriott left the Small Faces at the end of 1968 and the band ground to halt. It wasn’t long however before Lane, McLagen and Jones joined forces with singer Rod Stewart and guitarist Ron Wood who were looking for a berth together after the break-up of the Jeff Beck Group in the summer of 1969. Re-born as the Faces, the amalgamated line-up released four albums between 1970 and 1973 and enjoyed a bunch of boisterous hits, written by Stewart and Wood, including ‘Stay With Me’, ‘Cindy Incidentally’ and ‘Pool Hall Richard’. Lane co-wrote some of the Faces’ greatest songs including ‘Ooh La La’, ‘Had Me A Real Good Time’ and ‘Debris’, the latter being one of several numbers in the band’s repertoire on which he sang lead vocals. Having become disenchanted with the rock’n’roll lifestyle and sidelined by Stewart, whose inexorable rise to solo stardom was already well under way, Lane left the Faces at the end of 1973 and embarked on a wholesale change of scene. Leaving the big city and the trappings of the music business behind, he relocated to Fishpool Farm in the village of Hyssington, Wales which he turned into a freewheeling musical commune. Living and playing in barns, caravans and tents amid dogs, cats, chickens, ducks, and fields of sheep, a loose collective of musicians armed with acoustic instruments threw themselves into sessions that began in the local pub and then stretched on for hours or even days. Those involved at one time or another included Benny Gallagher and Graham Lyle (aka Gallagher & Lyle), Hughie Flint, Carol Grimes, Charlie Hart, Steve Bingham, Steve Simpson, Henry McCullough, Ian McLagen, Ian Stewart, Mick Weaver, Pete Townshend and Eric Clapton, among many others. The fruits of their labours were recorded on Lane’s Mobile Studio (LMS) a 26-foot Airstream trailer which Lane had acquired on a Faces tour of America, and was now parked in the farmyard. Slim Chance made a splash with their first single ‘How Come’, which combined the rogue-ish swagger of Lane’s erstwhile bandmate Rod Stewart with a rag-tag, gypsy folk-rock sound that became the template for many bands that followed, from the Pogues to the Waterboys. The tour, dubbed The Passing Show was organised after the fashion of a circus. The musicians and their families travelled in a procession of antiquated trucks and caravans which rolled into town, where they pitched a big top on the common or town square and played their show for the people. That was the idea, anyway. In reality the project was woefully disorganised, poorly publicised and even more poorly attended. The musicians were not properly accommodated or paid, prompting saxophonist Jimmy Jewell to abscond after a show in Scotland, leaving a note pinned to Lane’s trailer: “Goodbye cruel circus, I’m off to join the world”. The tour was eventually abandoned, in debt and disarray. Chastened but far from defeated, Lane returned to Fishpool where he continued to write and record with his ever-changing crowd of minstrels and guest musicians. Eric Clapton wrote ‘Wonderful Tonight’ on one of his visits there and somewhere among all the carousing and sheep-shearing, the albums Ronnie Lane’s Slim Chance (1975) and One For The Road (1976) were recorded and released. In 1983 Lane hosted an all-star concert at the Albert Hall, London in support of Action into Research for Multiple Sclerosis. Billed as The Ronnie Lane Appeal for ARMS, the show featured a historic cast of British rock heavyweights including Jimmy Page, Jeff Beck, Eric Clapton, Steve Winwood, Bill Wyman, Kenney Jones and Charlie Watts. The event ended with Lane leading the assorted stars through a version of the American folk standard ‘Goodnight Irene’. A further nine ARMS benefit shows, with slightly differing line-ups were subsequently staged in America, although Lane did not attend them all. Lane died in 1997, but his music lives on. 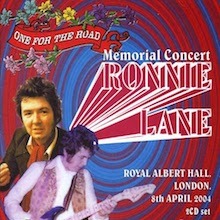 A compilation album Ooh La La: An Island Harvest by Ronnie Lane and Slim Chance, released in 2014, provided a magnificent 37-track distillation of Lane’s recordings after leaving the Faces. And in a heart-warming postscript to the story, a slimmed-down Slim Chance featuring Steve Simpson, Charlie Hart, Steve Bingham and Alun Davies, reconvened in 2010 with a mission to “create a show which celebrates the range of Ronnie’s later music.” The band has continued to the present. At their gig at Dingwalls in 2014, they were joined by other former Chancers, including Benny Gallagher and Billy Livsey, together with fire-eaters, clowns, magicians and can-can dancers in a fond homage to The Passing Show. The co-founder of the Small Faces turns in a low-key, easy-rolling gem even if he repackages some of his best material. "Stone," a whimsical ode to reincarnation, became "Evolution" when performed with Pete Townshend on his debut solo album, Who Came First. 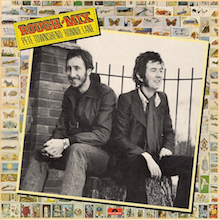 A heart-tugging riff from Slim Chance's "Give Me a Penny" shows up three years later on "Annie" from Rough Mix, another fine collaboration between Lane and Townshend. If you're going to get Slim Chance (and you should), pick the version that leads off with "The Poacher." Helped by Gallagher and Lyle, the song and its exquisite orchestration captures the spirit of the English countryside. The 3-way foldout digipak offers you a photo of PT on the left with RL on the right while the 20-page booklet is a pleasingly elaborate affair filled with collector's items provided by fans Michael Grimm & Carsten Kruse - American Promo 7" singles, Trade Adverts, British 45s and Foreign picture sleeves, Press reviews, the lyrics and a 2-page appraisal by Heinz Rudolf Kunze. But the best news is a wonderful remaster by JON ASTLEY that lifts every track. This CD sounds amazing (I had the US Hip-O Select version and it's a belter too) - beautiful clarity on the songs and the cool contributions by star guest like Eric Clapton. It opens with a winner - Townshend's "My Baby Gives It Away" sounding not unlike a "Who Are You" outtake. Lane counters with "Nowhere To Run" - a very Slim Chance tune greatly helped in the charm stakes by the Harmonica playing of Peter Hope Evans from medicine Head. The last thing you then expect is a funky-as-my-grandmother's-knitting-needles-in-full-flow instrumental - "Rough Mix" just rocks and has graced many a Seventies Fest CD of mine. Many will notice that with Eric Clapton on board - it's also a close run to another brilliant instrumental he had on his debut solo album in 1970 called "Slunky" (check that track out on "Eric Clapton"). "Annie" goes all Gallagher & Lyle (they're on it) while MCA tried "Keep Me Turning" as a single in the USA on MCA-40878. We then boogie with "Catmelody" with Ronnie abled helped by Ian Stewart & Charlie Watts (of some British Band). But if there are three songs on here that firmly push the record into five stars - they're all on Side 2 - Lane's "April Fool", Townshend's "Street In The City" and their sublime cover of the Don Williams country classic "Till The Rivers All Run Dry". Lane could be infuriating as a songwriter sometimes - always getting close to genius - but when he did hit that sweet melody and that sweet note ("Debris", "How Come", "Tin And Tambourine")- no one could come near him. Ronnie "Plonk" Lane could make you cry -and the gorgeous "April Fool" achieves just that. And as if lifted by the beauty of the song - it features what has to be Eric Clapton's best Dobro playing ever - gorgeously produced by Glyn Johns. Then you're smacked with something you don't expect yet again - the almost Quadrophenia majesty of "Street In The City" which Townshend cleverly fills with only his Acoustic Guitar against a stark String orchestra of Cellos and Violas - it's utterly brilliant. Bizarrely Polydor coupled it with "Annie" on the B and put it out as a 7" and 12" single in the UK on Polydor 2058 944 in a picture sleeve. Actually because it's spread across the full groove of a 12" single - when you play the vinyl version- it sound awesome (as it does on this CD). But my favourite is the album finisher "Till The Rivers All Run Dry" - a Don Williams classic dedicated to his father - it turns me to mush every time. Whenever I put it on a compilation people are always shocked at how lovely it is - beautifully done (lyrics from it title this review). The three beautfiully produced album outtakes are good without ever being great - the Townshend instrumental obviously being the basis of a song he never returned to. The best is the very British chug of "Silly Man" where Ronnie Lane shouts, "we're wasting energy..." at the beginning of the recording and then just launches into the tune. They're a cool addition to a great album. 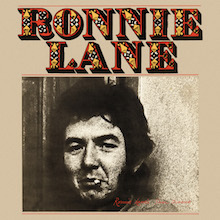 The title song from Ronnie Lane's third solo offering is a straight-ahead rocker in the style of much of his Faces material, in fact, you can almost hear the Faces plowing through this catchy number. 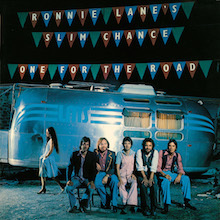 Billed as Ronnie Lane's Slim Chance, the album was released in 1975 to very little fanfare, despite great material and prime production from Ronnie himself. 'One For The Road' has a similar vibe and sentiment to the Faces classic 'Had Me A Real Good Time,' and all these years later rings just as true. At The Royal Albert Hall, London on 8th April 2004 after some 15 months of planning with Paul Weller, Ronnie Wood, Pete Townshend, Steve Ellis, Midge Ure, Ocean Colour Scene amongst them artists assembled to perform to a sell-out venue and to pay tribute to a man who co-wrote many Mod anthems such as "Itchycoo Park, All Or Nothing, Here Comes The Nice, My Mind's Eye" to name just a few. Ronnie Lane was the creative heart of two of Rock n Rolls quintessentially English groups, firstly during the 60's with The Small Faces then during the 70s with The Faces. After the split of the Faces he then formed Slim Chance and toured the UK in a giant circus tent as well as working in the studio with Eric Clapton, Pete Townshend And Ronnie Wood. 5,500 fans looked on in awe at The RAH as the superb evening's entertainment ended with "All Or Nothing" featuring a surprise appearance by Chris Farlowe on lead vocals.